Create your seating plan for free! With this tool easily create your individual seating plan for a class, a course or another specific group. It can be done without using paper, doesn't take much time, works in nearly every browser without any kind of further equipment or tool and IT'S FREE! At first, you need to type the name of the class and the amount of students into the intended textfields. Then type in the names of your students. All data will not be saved on our server but straight in your browser and URL. 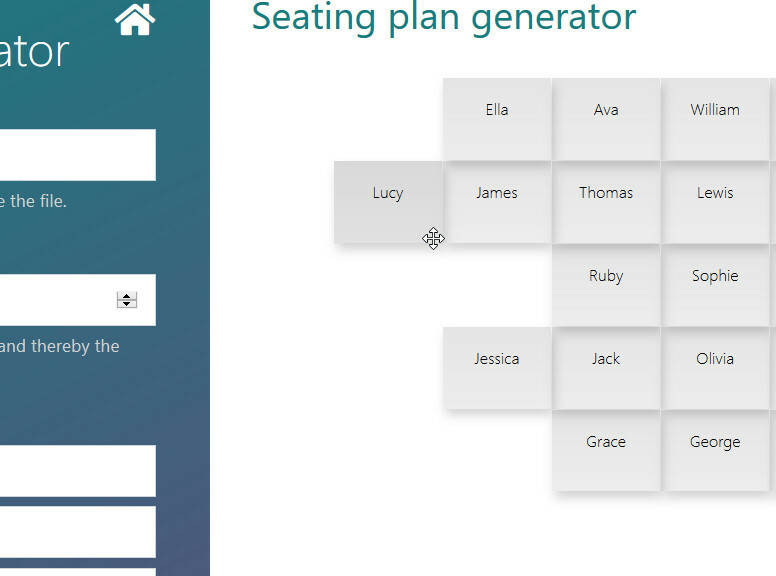 Now press the button "Create" at the bottom of your screen to refresh and draw the seating plan. Afterwards or before you can arrange the tables as in the classroom by simply using Drag-and-Drop. By clicking the button "Create" you can draw a new seating order while all tables will remain where you put them. If desired you can also print your seating plan by clicking the button "Print". You can also use the seating plan on other devices through copying the Link with the button at the top right corner. If you use our tool for several classes it might make sense to save each seating plan as bookmark in your browser.